The readings for this Sunday are about what happens when we sinners turn to the Lord in sorrow and true repentance. We are forgiven, freely and with joy in the heart of God. In our first reading (2 Samuel 12:7-10,13), we hear of King David's heartfelt confession for his grave sin against God. And yet, despite the gravity of his sin, God forgave David..
"Nathan said to David: 'Thus says the LORD God of Israel: 'I anointed you king of Israel. I rescued you from the hand of Saul. I gave you your lord's house and your lord's wives for your own. I gave you the house of Israel and of Judah. And if this were not enough, I could count up for you still more. Why have you rejected the LORD and done evil in his sight? "'You have cut down Uriah the Hittite with the sword; you took his wife as your own, and him you killed with the sword of the Ammonites. Now, therefore, the sword shall never depart from your house, because you have looked down on me and have taken the wife of Uriah to be your wife.'' Then David said to Nathan, 'I have sinned against the LORD.' Nathan answered David: 'The LORD on his part has forgiven your sin: you shall not die.'" Our Gospel passage (Luke 7:36-8:3) tells of the forgiving heart of Jesus. 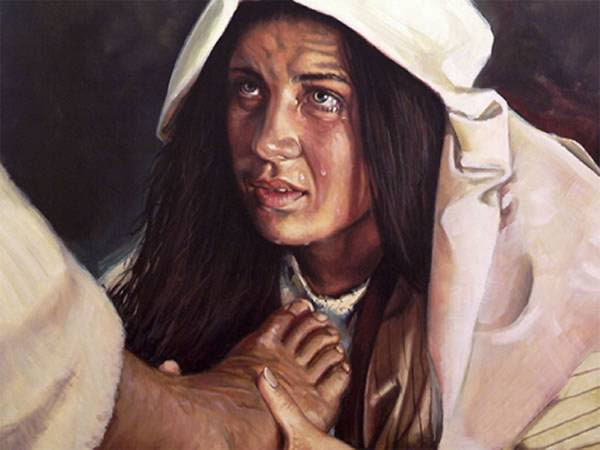 Jesus was criticized by Simon, the Pharisee, for allowing a sinful, yet tearful and sorrowful woman to wash his feet. In response, Jesus taught Simon about the great love and mercy of God. "Then he turned to the woman and said to Simon, 'Do you see this woman? When I entered your house, you did not give me water for my feet, but she has bathed them with her tears and wiped them with her hair. You did not give me a kiss, but she has not ceased kissing my feet since the time I entered. You did not anoint my head with oil, but she anointed my feet with ointment. So I tell you, her many sins have been forgiven because she has shown great love. But the one to whom little is forgiven, loves little.' He said to her, 'Your sins are forgiven.' The others at table said to themselves, 'Who is this who even forgives sins?' But he said to the woman, 'Your faith has saved you; go in peace.'" In our Epistle reading (Galatians 2:16, 19-21), St. Paul reminds us that good works alone will not merit salvation, but faith in Jesus Christ. "Brothers and sisters: We who know that a person is not justified by works of the law but through faith in Jesus Christ, even we have believed in Christ Jesus that we may be justified by faith in Christ and not by works of the law, because by works of the law no one will be justified. For through the law I died to the law, that I might live for God. I have been crucified with Christ; yet I live, no longer I, but Christ lives in me; insofar as I now live in the flesh, I live by faith in the Son of God who has loved me and given himself up for me. I do not nullify the grace of God; for if justification comes through the law, then Christ died for nothing." The Sacrament of Reconciliation is such a wonderful gift from God. We come to him in heartfelt repentance and in true faith to hear those soul-lifting words of the priest, "God the Father of mercies, through the death and resurrection of your son, you have reconciled the world to yourself and sent the Holy Spirit among us for the forgiveness of sins. Through the ministry of the church, may God grant you pardon and peace. And I absolve you of your sins, in the name of the Father, and of the Son and of the Holy Spirit. Amen." God invites you -- Saturdays 3:30 - 4:30 pm and Wednesdays at 8:45 am or by appointment.